Creating art is a joyful and challenging process. I enjoy the challenge of transforming a blank canvas by shape, color and texture into a painting that can convey that sense of joy. I work in acrylics because they allow me to layer and adjust colors as I paint but I do enjoy "painting" with other tools besides brushes and often use oil pastel sticks, collage, pen and ink, and various scraping and sanding tools. Starting with an abstract underpainting, I turn the canvas frequently until I settle on a direction for the piece, sometimes sketching on top of the abstract shapes but letting some of those shapes show through the layers. Each addition or subtraction changes things and I react accordingly. I continue to develop shapes and colors to unify and complete the composition with each painting ending up a blend of realism and abstraction. It's a process that I find enjoyable, stirs my creativity and keeps me coming back to my easel. 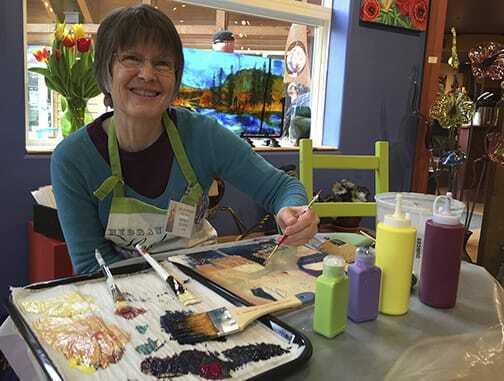 Wendy's colorful, whimsical work can be found in several Northwest galleries and in local art shows. She has also been a part of the "Art in Public Spaces” program, with her work hanging in several hospital galleries and public service buildings in Clackamas County.